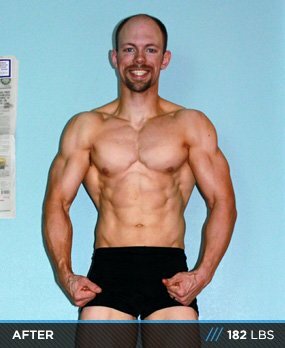 Body Transformation: Joseph Edwards-Hoff Wins 2012 MusclePharm Live Shredded Challenge! The 2012 MusclePharm Live Shredded Challenge ended on the day Joseph left for Thailand. He couldn't ignore the opportunity to show off his ripped physique! BODY FAT 15% HEIGHT 6'1"
"Heart, discipline, training ... be relentless!" Those were the words on the wall of the wrestling room when I was in high school. They have stuck with me ever since. I began lifting weights then in high school and kept at it ever since, with about a 2-year break after college due to an injured shoulder. After some healing, I decided that God gave me the gift to be able to put on muscle. I intend to use it! I've always bounced back and forth between powerlifting and bodybuilding. Though I've never competed, winning the MusclePharm Live Shredded Challenge may have been the motivator I needed to start. I feel closer to my long-term goals than ever before. For strength, I'd like to see my bench reach twice my bodyweight and my deadlift reach three times my bodyweight. For physique, I am shooting to get back up to 220 pounds, but this time at less than 10 percent body fat. Last, I hope to continue motivating my family, friends, and the high school students I teach. It's a thrill to be able to coach, teach, and inspire those around you to reach their goals. Congratulations on winning the MusclePharm Live Shredded Challenge! What inspired you to enter the challenge? Joseph: I looked at some of the challenges last year and thought about entering, but just didn't feel motivated enough to go for it. This year, I was on a lazy streak. 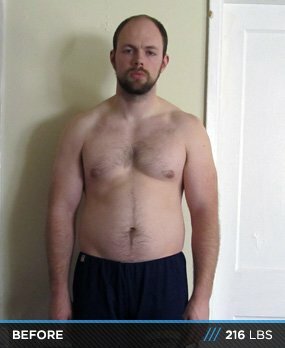 I wasn't eating well and didn't lift for about a month when I saw the advertisement for the challenge. If I entered that weekend, my 12 weeks would end the same day my wife and I would be leaving on our dream vacation to Thailand! So, I had two motivators. First, if I went in and didn't win, I'd be looking good for my beautiful, pregnant wife as we relaxed on the Thai beaches. Second, I have always felt like I had some unfinished business after my wrestling career ended much sooner than I desired. This challenge was a way to prove that I still had it in me to do something amazing. Well, to be honest, I wasn't that surprised. I truly went into this with the intention of reaching a state that would be in contention of winning the competition. I did the math to figure out what I would have to do to reach those goals. Though I wouldn't call it a surprise, it was definitely a great feeling to know that I did what I set out to do. I will say that my wife was surprised! You obviously stayed motivated throughout the contest. Any tips for our readers? results I should be seeing. If I saw those results, it really motivated me to know that I was succeeding. If I didn't see what I wanted, I made adjustments and stuck with it until I was back on track. Also, I did keep people involved with my transformation: my wife, my carpooling buddy, my pastor, as well as other friends and family. It helps when people are checking up on you. Were there any moments you wanted to give up? If so, how did you push through them and continue training? Every time my shoulder starts to act up I get discouraged. It reminds me of the two years that I just quit lifting because of how much it bothered me, probably more mentally than physically. But at the end of the day I pushed through. Sometimes it came down to working hard but praying harder. I'd definitely say the diet became the hardest part, especially at the end. I kept lowering calories the last few weeks of the diet to make sure I was on track. Toward the very end, I cut my sodium intake, which made food pretty bland. By that time I was counting down the days for the challenge end, but looking back, I am glad I stuck with it. Choosing a diet that has some kind of cheat meal to look forward to is essential. I did a cyclical ketogentic diet, so I had carb-ups, where I got to eat a lot of calories and foods that I had been craving all week. It let me feel like I wasn't stuck with the same old thing every day. A lot of people are going to read this and think, Nah, I couldn't do this. Not me. Tell them why they're dead wrong. It may seem odd, but knowing the science and math of nutrition makes a big difference. Doing a transformation could easily be described as a math formula. If you do A, B, and C for X weeks, you WILL end up at where you want to be. Then you KNOW that all you need to do is just A, B, and C. If you can focus on that, then you can reach any goal. So many people just "diet" without having measureable goals. If you set a goal that you can measure, it is easy to see your progress or where you need to make changes. Stick to that routine and you WILL see progress. I think I am going to try to start building muscle again. I really want to see my bench hit twice my bodyweight this year. 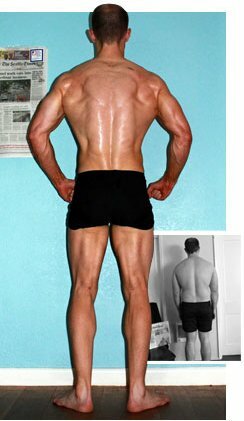 I also would like to see my deadlift get back up to three times my bodyweight soon thereafter. I plan to go back to a regular mixed diet, but I will be monitoring my total calories and protein intake. I want to eat just enough over maintenance so that I can gain about 1/2 pound a week. Then, maybe I can do another cut next spring to be ready for summer. To lose weight, I have never had better success than with the Cyclical Ketogenic Diet (CKD). You can lose weight quickly on a CKD while still maintaining your muscle mass. 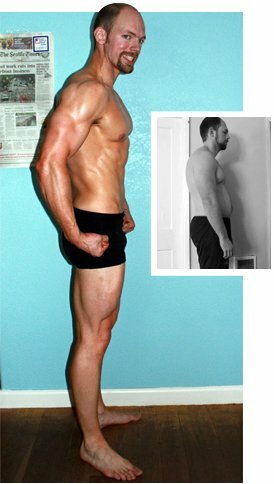 In my personal experience, I have been able to lose fat at dramatic rates without losing much muscle. The carb loads on the weekend are also a gigantic factor in being able to stick with the diet. One of the biggest perks is that I can go from eating 1,500 calories a day to eating 4,000 calories in a day without breaking my diet. It really helps reset my determination. Otherwise, regardless of what diet you choose, the most important factor in nutrition is correctly monitoring what you're eating. The best thing I have found is using a calorie counter on my smart phone, while also measuring everything I eat. No guessing. I realized early on that my guesses are typically wrong. My philosophy for training could be summarized as "For every season ..." I lift with a purpose and I make sure that the way I am lifting is conducive to meeting my goals. When I'm trying to put on strength I train one way; when I want mass, I train another. For the transformation challenge, I was on the CKD which required a very specific training regimen. With the large deficit in calories, I made sure not to overtrain. I just did what I needed in order to meet my goals. Monday and Tuesday were designed to deplete glycogen stores in my muscles, while Saturday's workout was to jumpstart my system for the carb load. Like my training philosophy, everything has a purpose. I think that there are many great supplements available these days and one of the only limiting factors for me is how much I can afford. Obviously these things add up, but in the end you will get better results. Some are more dramatically important than others. The most important thing is getting a good nutrition plan figured out. Once that is done, I would use as many of the following supplements as I could. Multivitamins and Fish Oil: These should almost be included in the nutritional plan, but they are supplements. They're important for your body in more ways than I can describe here. Whey Protein: It is by far cheaper to use a protein powder than it is to get it all from meat. It is also easier and can be absorbed faster, so it makes for a great post-workout protein source. Creatine: This is the mother of all supplements. It helps your muscle get bigger and stronger. Casein Protein: Another great protein source. It's more expensive than whey, but still cheaper than meat. Casein gets absorbed much slower than whey, so it makes for a good before bed shake or as something to sip on between meals. Pre-Workout/Nitric Oxide: Nitric Oxide products enhance your workouts. There are many different types out there, so read up and find out what meets your needs. Amino Acids: There are lots of different types of amino acid drinks out there, but I like having a BCAA drink during workouts to keep my muscles fueled. I also like glutamine before bed to help me sleep. Well, like I said above, I have different supplements for different times of the day. I have some protein that absorbs fast and another that absorbs slow. Depending on the situation, I had a supplement that met my needs. I also had a pre-workout supplement that had caffeine and another that didn't. That way if I worked out late I didn't have to take a caffeinated supplement. It also meant that I could use both on occasions for a really big pump. Though it can get expensive, the more options you have in your supplement cupboard, the more options you will have.